WASHINGTON, DC, December 14, 2011 (ENS) – Companies involved in offshore drilling for oil should take a “system safety” approach to anticipating and managing potential dangers at every level of operation to reduce the risk of another catastrophic accident such as the Deepwater Horizon explosion and oil spill, finds a new report on the disaster from the National Academy of Engineering and National Research Council. The system safety approach should extend from ensuring the integrity of wells to designing blowout preventers that function “under all foreseeable conditions,” emphasizes the scientific and engineering report, which was requested by the U.S. Department of the Interior. The report says the lack of effective safety management among the companies involved in BP’s Macondo Well-Deepwater Horizon disaster is evident in the multiple flawed decisions that led to the April 20, 2010 blowout and explosion of the rig 50 miles off the coast of Louisiana. Eleven workers were killed and the nearly five million barrels of oil were spilled, the largest accidental oil spill in U.S. history. “The need to maintain domestic sources of oil is great, but so is the need to protect the lives of those who work in the offshore drilling industry as well as protect the viability of the Gulf of Mexico region,” said Donald Winter, former secretary of the Navy, professor of engineering practice at the University of Michigan, and chair of the committee that wrote the report. “Industry and regulators need to include a factual assessment of all the risks in deepwater drilling operations in their decisions and make the overall safety of the many complex systems involved a top priority,” said Winter. In that state, the well would have been sealed until the necessary infrastructure could be installed to support hydrocarbon production. This report observes that several signs of an impending blowout were missed by management and crew, resulting in a failure to take action in a timely manner, as several other reports on this incident have noted, including those by the Joint Investigation Team and the President’s Oil Spill Commission. And despite numerous past warnings of potential failures of blowout preventer systems, the report finds that both industry and regulators had a “misplaced trust” in the ability of these systems to act as fail-safe mechanisms in the event of a well blowout. Blowout preventer systems commonly in use, including the system used by the Deepwater Horizon, are neither designed nor tested to operate in the dynamic conditions that occurred during the accident, the report states. Regulators also failed to exercise effective oversight, the report finds. It recommends an enhanced regulatory approach that combines strong industry safety goals with mandatory oversight at critical points during drilling operations. “This independent, science-based analysis of what went wrong in the lead up to the blowout has helped to affirm the tremendous efforts we have made in the last 18 months to raise the bar for safety and oversight of offshore oil and gas operations, Secretary of the Interior Ken Salazar said today. The report supports that assertion, saying that the U.S. Department of the Interior’s recent establishment of a Safety and Environmental Management Systems program – which requires companies to demonstrate procedures for meeting explicit goals related to health, safety, and environmental protection – is a “good first step” toward an enhanced regulatory approach. “Regulators should identify and enforce safety-critical points that warrant explicit regulatory review and approval before operations can proceed,” the report emphasizes. 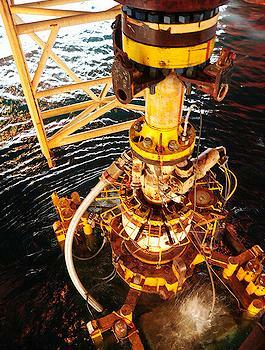 Blowout preventer systems should be “redesigned, rigorously tested, and maintained to operate reliably,” the report says. Proper training in the use of these systems in the event of an emergency is also essential. Operating companies should have ultimate responsibility and accountability for well integrity, the report says, because only they possess the ability to view all aspects of well design and operation. 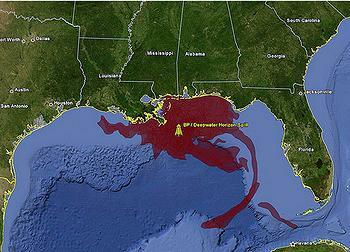 The cumulative oil slick footprint for the BP / Deepwater Horizon oil spill in the Gulf of Mexico is shown in red. The graphic was created by overlaying all the oil slicks mapped by SkyTruth on satellite images taken April 25 to July 16, 2010. The drilling contractor should be held responsible and accountable for the operation and safety of the offshore equipment. “From the outset, BP has acknowledged its role in the accident and has taken concrete steps to further enhance safety and risk management throughout its global operations,” the company said. The report recommends that both industry and regulators should “significantly expand” the formal education and training of personnel engaged in offshore drilling to ensure that they can properly implement system safety. It recommends that guidelines be established so that well designs incorporate protection against the various credible risks associated with the drilling and abandonment process. In addition, finds the report, cemented and mechanical barriers designed to contain the flow of hydrocarbons in wells should be tested to make sure they are effective, and those tests should be subject to independent, near real-time review by a competent authority. Reporting of safety-related incidents should be improved to enable anonymous input, and corporations should investigate all such reports and disseminate lessons learned to personnel and the industry as a whole. Finally, because offshore drilling operations are currently governed by a number of agencies, sometimes with overlapping authorities, the U.S. should make a single government agency responsible for integrating system safety for all offshore drilling activities. 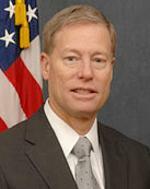 “Today’s report reaffirms many of my top priorities,” said James Watson, the newly appointed director of the Interior Department’s Bureau of Safety and Environmental Enforcement, BSEE, established in October when the DOI’s previous regulatory agency was split in two. 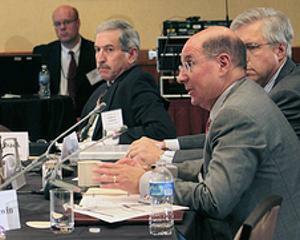 On October 1, 2011, the Department of the Interior established two new, independent bureaus – the BSEE, and the Bureau of Ocean Energy Management, BOEM – to carry out the offshore energy management and safety and environmental oversight missions that were under the jurisdiction of the Bureau of Ocean Energy Management, Regulation and Enforcement, BOEMRE. The establishment of BOEM and BSEE mark the completion of an effort to reorganize the former Minerals Management Service, which was found to be corrupt and ineffective by the department’s Inspector General. 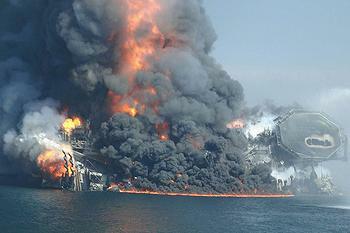 After the Deepwater Horizon tragedy, the Obama administration put new safeguards in place to protect the environment, including heightened drilling safety standards to reduce the chances that a loss of well control might occur in the first place, as well as a new focus on containment capabilities in the event of a blowout or oil spill. Click here for more information on new regulations and standards for both shallow and deepwater drilling operations. The National Academy of Sciences, National Academy of Engineering, Institute of Medicine, and National Research Council make up the National Academies. They are private, nonprofit institutions that provide science, technology, and health policy advice under a congressional charter. Areas of expertise of the 15 members of the committee that wrote the report include: geophysics, petroleum engineering, marine systems, accident investigations, safety systems, risk analysis, human factors and organizational behavior. Committee members include: U.S. Navy Rear Admiral Thomas Eccles, chief engineer and deputy commander for naval systems engineering, and David Daniel, president, University of Texas, Dallas, a member of the National Academy of Engineering.